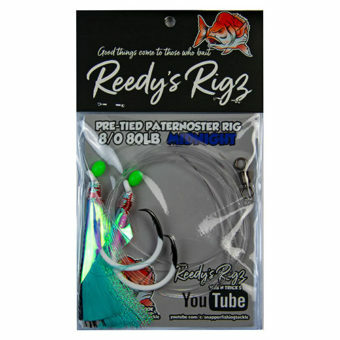 Below is a Video of us going out and fishing for snapper using Reedy’s Ultra Rigs you can see in the video. we catch a Big Haul of Reds. We now Turn our Attention to Queensland & Western Australia as the Reds with Coming to Spawn along the coastal In shore reefs Such as Burley Heads, Kings cliff and Brisbanes Morton bay . These Snapper rigs have Been Designed with the best components. Hand Tied on 80lb Leader they Range From 5/0 to 8/0 in 4 Colours Each with a Lumo hook and with out. The Dominator Circle Hook is an Offset Hook to Provide a Better hook up rate for hungry anglers. Its very important to Fish Quality Hooks as big snapper are know to Destroy Hooks. Its worth having one of these rigs in your tackle box this season. And you can see why. This entry was posted in products, snapper Fishing, Tackle and tagged south australian snapper, ultra rigs, western australia snapper.